Located in the geographical heart of Germany since 1905, Herbacin’s distinctive brand image reflects its close proximity to deep green forest and flowering meadows. Cultivating its own plants and herbs for decades, Herbacin products is synonymous with quality and tradition in the field of natural cosmetics. 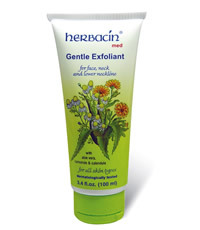 Herbacin’s Gentle Exfoliant refines the skin’s contours and encourages a radiantly fresh complexion. It contains special exfoliating microbeads from natural jojoba oil. Tiny ‘injuries’ to the skin, which can be caused by coarsely ground synthetic granules, do not occur with jojoba wax beads. The base of Gentle Exfoliant is a very soft cream containing safflower oil. With extracts of aloe vera, camomile flowers and margold, it has a soothing effect and protects against dehydration.